Scented leaves of Curry Leaf Tree plant, Murraya koenigii, are used to flavour curries, chutneys, stir fries and other dishes. Leaves loose flavour when dried, but can be preserved in oil or by vacuum sealing. Purple-black fruits are edible. Traditional Indian folk use as a remedy dysentery, indigestion and nausea. A poultice of leaves used on burns and wounds. A useful culinary plant. 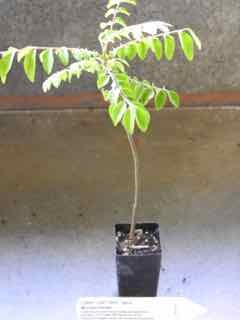 Curry Leaf Tree plant is native to India and Sri Lanka and is adaptable to most well drained soils and most positions, but prefers full sun. Clusters of small white, fragrant flowers in summer. Drought and frost resistant. A deciduous to evergreen shrub, growing to 6m or prune as tub specimen. Seed for Curry Leaf Tree. Be the first to review “Curry Leaf Tree, plant” Click here to cancel reply.